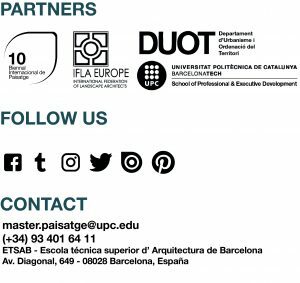 POGGIO INTERNATIONAL WORKSHOP – Aquilone 2018 – Simonetta BASTELLI – Master in Landscape Architecture Barcelona – Universitat Politècnica de Catalunya – 35ª EDITION. Masters in LANDSCAPE ARCHITECTURE. BARCELONA. The cultural association “Simonetta Bastelli” announces the call for the international workshop in Poggio Aquilone, San Venanzo (TR) next September 2018. This workshop is intended for 20 academics and it will take place in the old town of Poggio Aquilone in the city of San Venanzo from Tuesday, September 18th, to Friday 21th, 2018. The 2018 edition theme will be “The garden square as a place of reference and identity”, where participants will work with the relationship between Architecture and Nature. The participants will be divided in four / five working groups, each one coordinated by a tutor. In addition, the project will be developed with an international group of professionals, active in different areas of landscape. Twenty academics can take part in the workshop whose profiles may be: PhD; PhD students; graduates with a master’s degree; graduates enrolled in a master’s degree; graduates and students. The results will be announced by email and published on the website www.simonettabastelli.com before June 23th, 2018. – SECOND PHASE: All selected participants must complete the registration before July 13th, 2018 by paying, via bank transfer, a contribution for allowances and accommodation, on a total of 180.00 € . 1. PhD thesis on the subject of landscape; PhD students interested in landscape issues; graduates with a master’s degree related to landscape issues. 3. Graduates, with an academic curriculum and/or professional materials, interests, research related to landscape. 4. University students with an interest in landscape. Questions or enquiries must be sent by email to: premio@simonettabastelli.com (until May 31th, 2018). The organization will send all the analytical material for the execution of the project before the start of the workshop. The assemble groups will work with the respective tutors, and will present the project in 3 sheets, in A2 format. The material must be sent to the workshop organization before 5.00 p.m. on Friday, September 21, 2018. On the morning of Saturday, September 22, at 9.00 a.m., each group will present, in public, their proposal to the jury. The proposals will be analyzed by a jury that will select the group worthy of the prize. The prize will take place on September 22, 2018. The material developed during the workshop will be displayed during the prize exhibition. The organization reserves the right to exhibit (also in other places) and / or publish these works.